Air Niugini now services the state of Chuuk and Pohnpei in the FSM. They began servicing the FSM in September of 2016 to, "test the market". 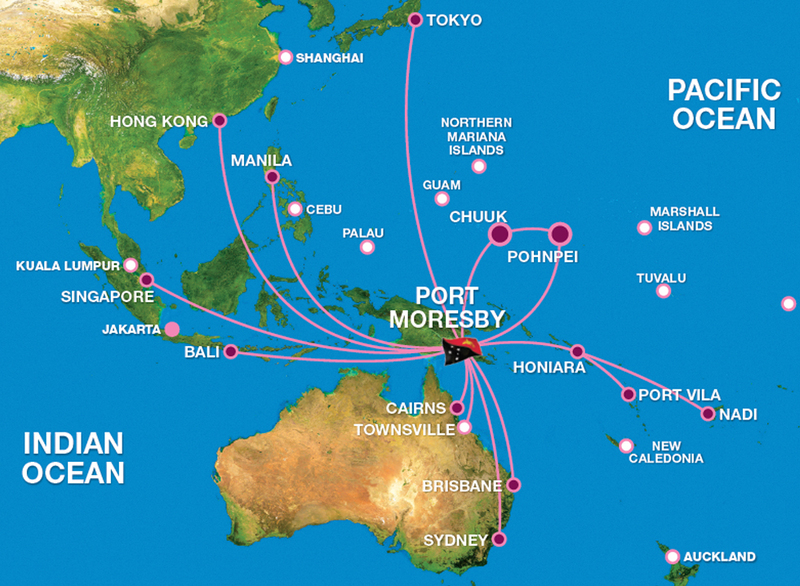 Their Micronesia service begins in Port Moresby, the capital of PNG. Then it goes directly to Chuuk, then Pohnpei, then back to Port Moresby. The service offers another option for international flights for the FSM. From Port Moresby you can travel to such destinations as Hong Kong, the Philippines, parts of Southeast Asia, and even Australia. Recently, president Christian of the FSM visited PNG to meet with Air Niugini leaders to discuss continuing the service. “We are extremely happy with this new service and my government will continue to work with Air Niugini to ensure the route is sustainable." - President Christian. Air Niugini Chief Executive Officer, Mr. Simon Foo added, "The route is picking up and we are working closely with those responsible to grow the market. Similar to PNG, FSM has huge tourism potential which we must continue to work hard to tap into and increase the volume of travellers visiting our two countries." Other than the tourists, the airline's weekly services to the FSM offer a much needed third option for locals. Currently United Airlines services the majority of the FSM, and the Micronesian region in general. Nauru Airlines also recently began servicing the region but with limited flights to Majuro and Pohnpei. Let's take some time to compare prices. If you are flying Nauru Airlines from Majuro to Pohpei, the cost will be $220.39. The same flight destination using United Airlines will bill you at $567.00. Comparatively, flying Air Niugini from Chuuk to Pohnpei will cost you, $132.00. The same flight on United will bill you, $289.00. That's more than double for both examples. (Prices subject to change). Other than having more flight destinations, United also has more frequent flights to the islands. At the moment, Nauru Airlines only flies to Pohnpei once a week. Air Niugini twice a week. United has regular flights 3-4 times in the week circling Micronesia. It is also the only major airline that goes to Yap. Over the summer I had the chance to fly Air Niugini. And here is my personal experience with the flight. Comfort = This was probably the most comfortable flight experience I’ve had in Micronesia. The short 1 hour flight was smooth and noticeably quieter. The leather seats and spacious leg room were welcome. If I could boil it down to three words, the flight was fast, quiet, and smooth. Extra leg room on Air Niugini always welcome. Service = They offered sandwiches and wraps for the flight, compared to United’s peanuts. Not a big deal but an interesting comparison. The flight crew was polite and professional. Basically what you’d expect from conventional airlines. The big takeaway from the flight was the price. At the time I paid $97 for a one way ticket from Chuuk to Pohnpei. As explained earlier, the United ticket was $289.00. About three times the difference. Though the price has gone up ($132 as of August) that is still less than half the price for United. But here is where Air Niugini fails. Earlier in the year I booked a flight to Pohnpei that cost about $83. The night of the flight, the plane didn’t arrive. It was not delayed, it was cancelled. There was no notice until we got to the airport. The reason they gave for the cancellation was that the Chuuk airport workers did not show up to work. Because of this, the plane skipped Chuuk and went straight to Pohnpei. Although they claimed it was the airport's fault, I still have not been reimbursed the $83 for the cancelled flight. In addition, there was no clear process for a reimbursement. We had to talk to an employee who contacted someone, who then had to contact someone else. All of this happened in February and I’ve yet to be reimbursed. Though we’ve been told that a reimbursement is in order. Now, that is a huge issue. But it is fixable especially in this early stage of the airline’s new service. Also worth pointing out, even after not getting reimbursed the $83 then paying $97 for another flight, for a combined total of about $180. That’s still cheaper than United’s $289. Still, the lapse in service meant re-planning a trip. Which cost time and money. I won’t stop trying to get my $83. But in the meantime, I’ll mark it down as an investment in the company. Which is what I hope more people can do. Invest in alternative airlines so as to boost competition. This will in turn benefit us with cheaper prices and better services. If the airlines see that there is a demand they may add more flight times and offer different destinations. Then, and only then, this decades old sentence from Continental and United Airlines won’t seem so dishonest: “Thank you for choosing United Airlines”.